The production of milk products like butter and buttermilk, cheese, fermented milk products, curd and whey is subject to strict hygiene requirements. This poses numerous challenges, such as achieving an appropriate level of air hygiene. With a holistic filtration concept adapted to your needs, you can keep everything under control. The ideal filtration solution must always take into account your individual process requirements. To this end, we work with you to evaluate your current ventilation system and identify recommendations for the design, installation and maintenance of an optimal filtration solution. The production of highly sensitive products such as infant formula demands filtration systems of the highest reliability, quality and efficiency. This applies to both the process air filtration and the ventilation systems in the process areas. Air contamination monitoring is another indispensable measure for protection of the milk powder. We assess the production situation at your site to identify the optimal filtration system for you. 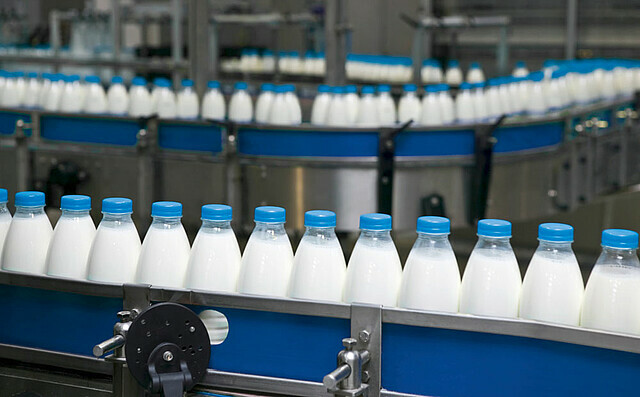 Consistently controlled air quality in the milk filling hall or clean room prevents the build up of microorganisms presence and increases the shelf life of the products. Aseptic filling lines must also be equipped with efficient, high-performance filters to completely eliminate pathogens and reliably protect your products. Freudenberg Filtration Technologies supplies reliable filtration solutions for all your milk filling requirements. Fermented milk products, curd, whey, cream, ice cream. In the production of these milk products, the more sterile the processing, the higher the quality and the longer the shelf life. To avoid microorganism and particle contamination, it is essential to monitor the air quality and air exchange together with the temperature and humidity in the filling hall or clean room. Achieve the highest quality in the production of butter, cream and spreads. A filtration system individually adapted to your needs offers optimal protection and, together with reliable temperature and air movement control, minimizes the contamination risk. Cheese production is an art in itself, and the production and processing present as many challenges are there are types of cheese. The packaging of cheese is also associated with a high level of risk. All individual areas must be optimally protected and safeguarded with highly efficient filter solutions. The production of soft cheese in particular demands the greatest care in achieving a controlled air quality to ensure the product shelf life. Benefit from our specialized expertise in food and beverage industry. Discover our products for dairy production. Satisfy the highest requirements for clean air and sterility of filter classes E11 to U15. Reliable protection against particles and microorganisms. The MiniPleat technology ensures a homogeneous media velocity for safe, economical operation. Filter media that is progressively structured of high-performance nonwovens, produced from non-breaking fibers ensures high durability and long useful lifetime. Wide selection of appropriate dust removal elements, variable in terms of shape, overall height, nominal diameter and pleat geometry. For maximized performance. Viledon gas phase filtration solutions are designed to protect sensitive components and systems against corrosion.